The thing is that just because you are a school doesn't mean the students are using Google Apps. I work for a high school, and we are blocked from Google+. Despite the fact that we only use Google Apps for the staff. Just blame it on Google's and our lawmaker's bigotry: adults under the age of 18 should not be bared from using such services. maybe it sis a temporary act from google.. BUT: the Google+ iOS App isn't working for me..
After loggin in I received een 'Opt-in' message with 'You need an invite?? No option to turn it on for me in the GApps CPanel. We're using the new account infrastructure and GTalk and Picasa are enabled for all users. We use GApps for Business. Is it again limited to US only? I'm also happy that it's now enabled for Google Apps users but the Android Google+ application doesn't work. 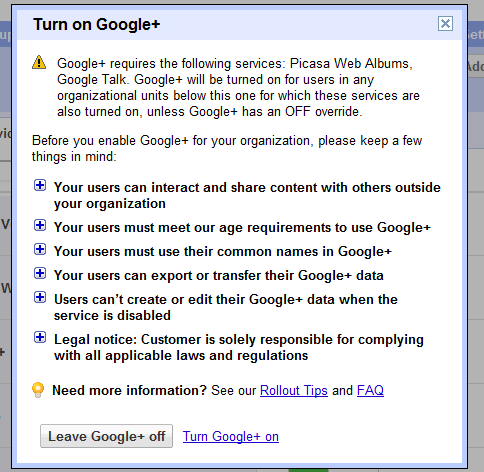 Schools also need Google+, with the possibility to block contacts outside the organization. It is necessary to protect kids from the lack of security of Facebook, and the best way is by giving them a controlled environment like a Google+ for schools. Yeah. I also use a Apps for my personal domain. But yeah. No luck with the android app. Is it again limited to US only? Presume only a (short) matter of time before Android App gets an update for G+ to work? Similar issue with the Android Google+ app. It fails when trying to connect to the server. Now it's just the core left; the youths. Google+ for cell phone creates giving the right items with the right individuals a lot easier. Still, the android application for G+ (when using google apps) is not working. Can we expect some official answer from google about this?